Several U.S. carriers are offering special deals and discounts for shoppers looking to buy an iPhone 5C or iPhone 5S. Here’s a handy chart to help you find the best deal. Note that these offers don’t take into account trade-in values of existing smartphones or upgrades you may be due from your carrier. These are standard rates carriers will charge new customers, or customers signing up for a new/different plan. Each phone is shown with a starting configuration of 16GB; in general, moving up to 32GB or 64GB will add an extra $100 each. 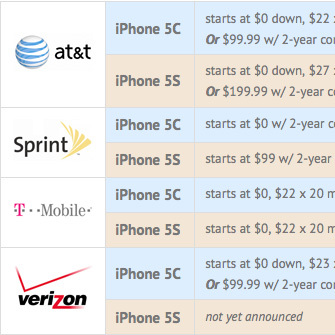 Also worth noting: Apple’s baseline MSRP with a standard 2-year contract is $199 for iPhone 5S and $99 for iPhone 5C. Though not a carrier in and of itself, Walmart’s in-store wireless shop is offering a special discount for both new iPhones. Walmart’s wireless stores allow customers to sign up for a 2-year contract with the carrier of your choice. Also worth mentioning for the budget conscious is that there are several companies out there such as Gazelle that will pay you cash or gift cards just for sending them your old iPhone. Even Walmart is doing it these days. These funds can then be applied to your new iPhone purchase. * “AT&T Next” is this carrier’s program for essentially “renting” a smartphone for a monthly fee, which lets you upgrade to a new device once a year. ** “Bring Your Number” is a program where customers of other carriers switch to Sprint and bring their existing number along. BYN is a limited-time offer. *** The “Verizon Edge” program is similar to AT&T Next, in that you get more flexibility regarding how often you upgrade.